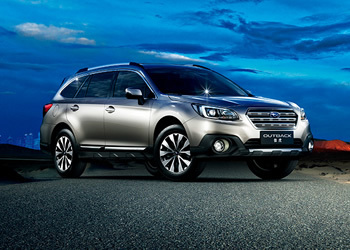 Tokyo, November 13, 2014 - Fuji Heavy Industries Ltd. (FHI), the manufacturer of Subaru automobiles, is pleased to announce that it will exhibit the new Outback (Chinese specs.) at the 2014 Guangzhou International Auto Parts & Accessories Exhibition to be held in Guangzhou, China (Press day: November 20, Open to the public from November 21 through 29, 2014). In China, the all-new Outback comes with a 2.0-liter Horizontally-Opposed direct injection turbo engine developed exclusively for the Chinese market as well as a 2.5-liter Horizontally-Opposed engine with about 80% of its components newly designed. In preparation for its launch in China during 2014, the product lineup has been renewed in view of Chinese market's demands. Since its inception, the Outback has found a place in the hearts of drivers around the world as the embodiment of Subaru's unique crossover concept, combining passenger-car comfort with the long-distance capabilities and load space of an SUV. Following on from its introduction to the North American and Japanese markets, Subaru thoroughly refined and advanced this concept in developing the new Outback. At the same time, Subaru incorporated a host of advanced design features worthy of its top-of-the-line crossover model to build in a level of strength and quality befitting a vehicle that is a partner in action-packed lifestyles. The Subaru press conference is scheduled at 11:00 am (Guangzhou local time) on November 20th at Subaru booth (Hall 1B03).